I brought along a new pair of socks for the two hour ride to see Ella today. but they got her little house put in also! What a great treat to see Ella squeal with delight! She tried all the doors, windows and shutters and her own doorbell! We put some dishes in for her and she immediately set to play. In fact, we had a very hard time convincing her to take a walk to the beach for a swim! But since Grandma and Grandpa were going, she decided to come also! Grandpa took her out for a swim........Grandma watched from shore! It was low tide, so it was very roomy at the shoreline even for a Saturday! Caleb even showed me what to look for to find a shark's tooth. They find them every time now-this one is tiny(3/8") but it still stands out as a tooth! 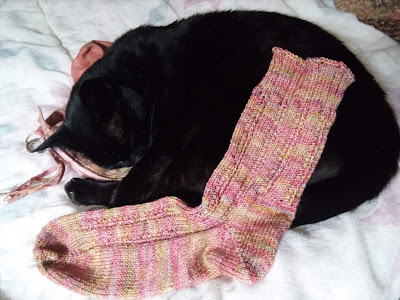 I finished the ripples socks that look like ocean waves........knit in KnitPicks' Stroll in the Pacific Tonal colorway. And got this idea to use all the different yarns left over from my samples from three years of the Fiber Binder Club! I am going to make a long scarf using each of the fibers in order of their shipment-so far I have five different fibers done-from the bottom-Corriedale, linen, Border Leicester, Llama and Cormo on the top! It is fun to whip through the different yarns! I added another batch of soap this morning-this one has been on my mind for a while, it just had to wait its turn! This is scented with lemongrass and lavender with lavender buds in the soap. It smells incredible in the house; I can't wait to try it! I have been dying to make and wear a maxi dress. (Again) I cut off the top of a women's beater top and added 2 2/3 yard of skirt material and I have a very comfortable and cool lounging dress for myself! 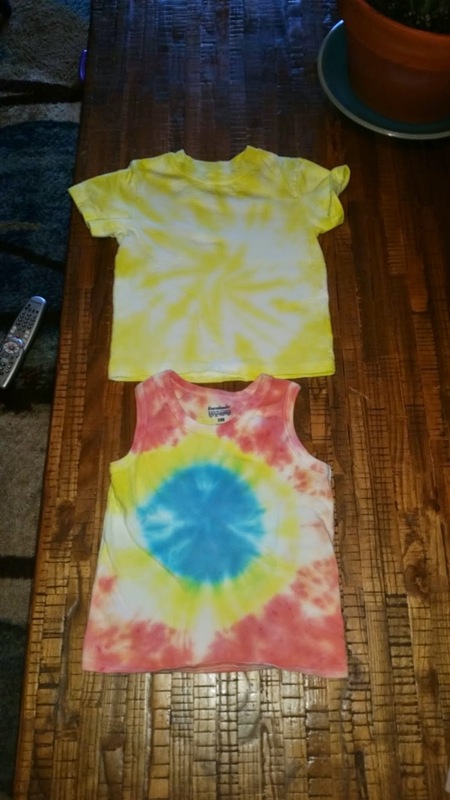 It was so successful, I have another top to buy fabric for so I will have another! The truck is loaded up with some girly toddler toys and we will be delivering it tomorrow-stay tuned! Nyki almost fits-I wonder if she has wanderlust to visit her fur cousins?! The patriotic quilt has borders; I hope to load it on the empty frame today! I did another of the many batches of soap I need to restock my shelves-this one is Patchouli and Peppermint per Bill's request! It does smell kind of candy store/head shop-ish!!!! I wrap it for a few hours to keep the temperature up. I also cut up and pressed the binding for the patriotic quilt so it will be ready when it is off the frame! I made a new batch of soap-everyone in the family is enamored of the peppermint oatmeal soap. I will be experimenting with a few additional scents over the next week , though! I sliced up the four pound loaf 24 hours later-the whole sewing room smells deliciously of peppermint! When movement is impossible, I draw ideas........they will come about someday! I sit in my recliner and knit when I can't move around. My hands hurt, but I can push through an hour of knitting at a time! I'm calling it physical therapy! Bill is trying an experiment of a different sort-there is a disease that palm trees get where their trunk rots away a bit at a time at the base. Bill has decided to try and see if he can inhibit the progress. First he painted the tree trunk a bit below ground level. And then he painted it with tar to seal the base. We will pull the dirt back and plant some flowers around it when it dries and hope we can save the tree for years and years. Cassandra brought me a yard pretty! I hung it in the big live oak you see coming up the driveway. We will see if that pesky wren decides to move in! The sock is taking shape-I turned the heel and am working up the leg. I made progress on the quilting frame, too. In fact, this morning I put the last stitches on and took it off the frame! I will be mailing out the quilt top on Monday! This one-it is top down........the bottom is fancier and I will show you when I get that far. I finished piecing the last two rows and got them attached. Now I have to figure out how I am going to work the edges-borders? I want to border it but there isn't any fabric in the stash to do this so I will let it sit as I think about it. I worked a piece of glass fusing........while this looks interesting, it is really garbage because each of the bits are supposed to be colored brightly but I cooked it too long obviously, and the color cooked off the dichroic glass. Remember this is still a learning curve. These rainbows turned out fun-They are made by stacking pieces on their edges and melting them together. This Hibiscus bush survived the winter and produced a very large blossom! This view gives a better idea of the color. This is a chocolate bromeliad! I wonder why I bought this one........? I have some white Yarrow in bloom. In fact, the Yarrow has reseeded itself and it is coming up all over this area! It is a very pretty fern-y looking plant. Does anyone know what part you use for an herbal tea? I did some serious pruning to the pencil cactus in the center of this garden and now all the other succulents have a better view of the world and me , them! The Desert Rose is glow in the dark beautiful! So glad it has fully bounced back from the frost damage! This plant stands about four feet high and the same wide-it is a show stopper! Even if a bit of a litter bug! The girls let loose with more tie dyeing this weekend! And some for the big kids! 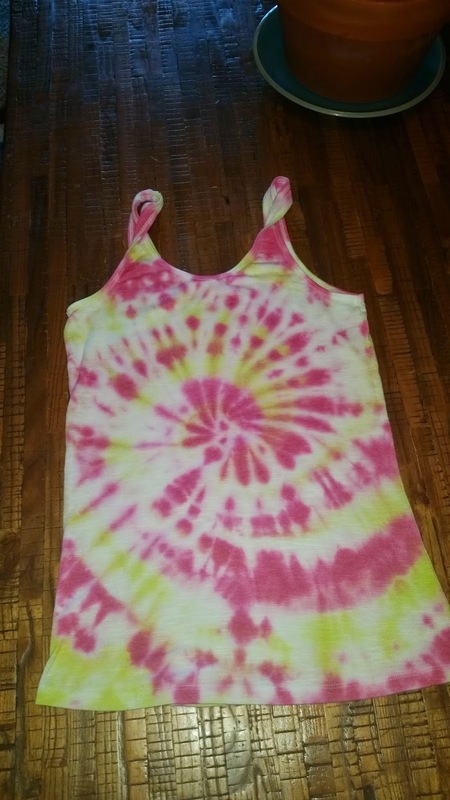 This is a Pinterest inspired tank-pretty cool, huh?! The guys did more of this and the water was warm enough for their wives to join them this time! I stayed in the peanut gallery with the camera! he even figured out how to give Ella a drink-well, occasionally! Trying to hold onto water is an interesting activity! This is our little model...she is so funny in front of the camera! The kids were yelling at us about something out the window but we were all talking and didn't clue in....until Will yelled, 'Bird!' and we saw the Sandhill Crane out front-yes, it was yell-worthy, Will! Ella very sweetly agreed to model her new dress before she had to head home-she didn't want to take it off -I'm glad she likes to dress up!